Here is our first Greyhound, Butler in his favored spot. As a new dog owner it had not occurred to me that the dog would even want to sit on the sofa. They were supposed to be floor creatures and sleep in dog beds. I soon found out this was not true. Butler liked to be on the sofa regardless of who else was sitting there. I did not realize the magnitude of my ignorance until it dawned on me that he slept with his mouth open and it was really time to buy a steam upholstery cleaner because it was way too late to get the dog off of the sofa. I have become quite good at steam cleaning upholstery and recently cleaned the interior of my husband’s BMW. A proud moment for anyone. Another thing about Butler was wherever I went he wanted to follow. One night it was raining and my husband was painting window trim. I went outside and hesitated, thinking I should take the dog with me because he had a tendency towards mischief. Unfortunately, I left him in the house while I went out to pick some Rosemary for dinner. Bad idea, I came back in the house to find him licking paint off the windowsill. It was late and my vet was closed for the night so I went to read the paint can…not good. Paint contains an antifreeze like component to help it dry and yes, it will poison dogs. I bundled Butler into the car and took him to the Emergency Vet. He was undisturbed by the entire event and happy to go for a ride in the car. I sat and sat while they administered activated charcoal to the dog. I envisioned Butler funneling fish tank charcoal like he was attending a frat party. I am not exactly sure how they got the charcoal in him, but they got enough in there soon enough that he would be fine. Somehow charcoal absorbs the poison so the dog doesn’t. The Emergency Vet gave Butler back to me after I paid a good sized bill, but failed to mention the rate at which the charcoal would fly out of the dog. It was after midnight and raining, we were a mile or so from home when Butler started whining a bit. “Hold on guy, we are almost home.” I said. I pulled into the garage and looked into my (previously) tan Jeep interior. Finding it charcoal spotted. Oops. The good news is charcoal neutralizes odors. The next morning I looked outside (it was winter and the grass was brown and dormant) to see a 10 foot long black streak in my neighbor’s lawn. Then I looked in the back of my Jeep and was happy I had the steam cleaner. Like I said, I am good at cleaning car upholstery, although charcoal is a bit of a challenge. 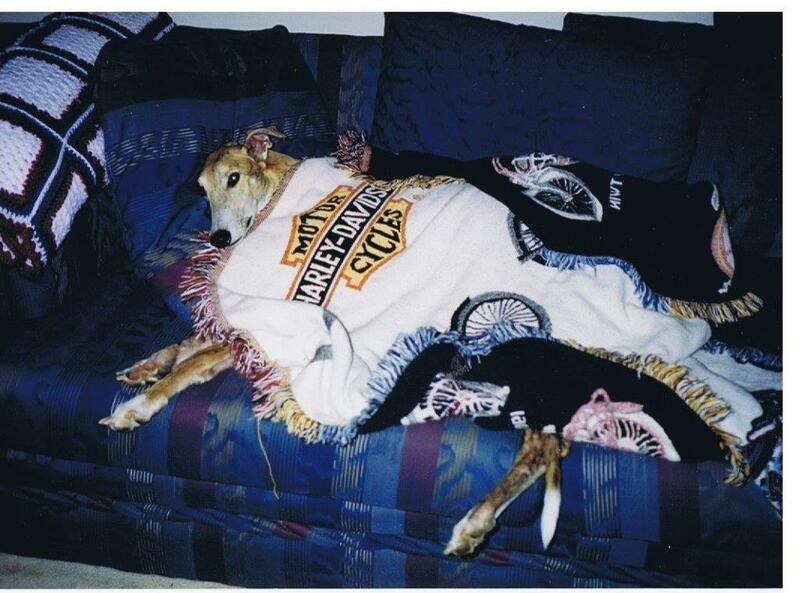 This entry was posted in Dogs and tagged Dogs, Greyhounds. Just wanted to say how much I enjoyed your blog! Happy to read that your pooch is fine – laughed all the way through – thank you! All hail Butler, a dog among dogs! Just finished reading your “Summer / Not-Summer” blog… Loved it… felt the same way when I first moved to South Florida from up north (the Sopranos line killed me lol). I found your site looking at google images of bromeliad beds (I’ve been collecting them myself). Thank you for sharing your stories… love them! Thanks again, I just sold one of my dog stories to a national magazine. Yay.. I have been wondering about the quilt icons, I get comments from a lot of people who use those. Is it blog related? Not sure what a quilt icon is… if it’s the emotion icons, people love using them (thumbs up, smiley faces, laughing, etc) in blogs and forums. it is the green and white square that appears by your name, it looks like a quilt square (to me)? Too funny, I have been mystified by all the quilters and there are no quilters! Thanks! lol… I didn’t even notice it until you pointed it out! OK, thanks..here I thought there were legions of quilters!! Somebody (or somebody’s Mom) at WordPress must be a quilter.